It is not easy to overstate the cataclysmic effects of the run-up to the implementation of the Meiji ‘Restoration’ in Japan in 1868. An analogy might be the change from the Communist regime in Russia and Eastern Europe to the so-called free market of the west. The change affected every aspect of Japanese life; a new sense of a single nation, as opposed to a series of regional loyalties, was created; a constitution was written; land reform, education reform, reform of the justice system, transport, almost every aspect of Japanese life was radically altered, much of it closely adhering to western models. It was a triumph for the new ruling oligarchy that it succeeded. It was not really a ‘restoration’; the Emperor remained the titular head of the nation, deeply revered and almost worshipped, but was in effect a constitutional monarch under a parliamentary system instead of under Tokugawa Shoguns. The word Meiji means ‘enlightened government’, and the new government had as a primary aim in the bringing of Japan into the group of the modern western industrial powers. It was essential to gain parity with the west in order to renegotiate the ‘Unequal Treaties’ imposed upon Japan by the western nations in the 1850s. One of the ways the government decided to do this was to demonstrate to the world the brilliance of Japanese craftsmanship through the media of the International Industrial Expositions that were such a feature of the second half of the nineteenth century and the first two decades of the twentieth. The legacy of craftsmanship of the Edo period (1600-1868) was vital to this; it was not so much the craftsmanship that changed as the clientele. Craftsman had to adapt to a totally new demand, a demand from the west for new concepts in shape and decoration which must have been more than alien to them. Earlier Japanese visitors to Europe had noted the love of decoration of the time; High Victorianism. Naturally, craftsmen attempted to cater to such a perceived demand, and early Meiji exhibition pieces do tend to look as if they were designed by a committee: they often were. But for Japan this was a revelation; this was new; this was the future. The first International Exposition to which the Japanese contributed was that in Paris in 1867. To this, two independent clans, the Satsuma and the Saga contributed as well as the Tokugawa Government itself; significantly, the Victoria and Albert Museum made most of their purchases from the Satsuma stand. It was not until the Vienna exposition of 1873 that the Japanese scored a major success; this, of course, was after the ‘restoration’ and the new government actively encouraged the promotion of the sale of Japanese art-crafts’ by the setting up of the Kiriu Kōshō Kaisha (First Trading and Manufacturing Company) [the first word used to be read Kiritsu, but Kiriu is now known to be correct.] This company provided designs by painters, often in the late Edo version of the Rimpa style, for craftsmen in other materials to convert into metalwork and other materials, often, of course, on rounded as opposed to flat shapes. To some extent this fossilized these crafts, and many craftsmen failed to notice the dramatic changes in western taste that were occurring at the end of the nineteenth century. Other companies, such as the Ōzeki Company, or the Maruki Company, were set up privately or with government help; certainly with government encouragement. These companies were entrepreneurs in the commissioning of works of craft of high quality from well-known craftsmen and exhibiting them under (and even inscribing them with) their own names as opposed to the craftsmen who actually made them. In the five National Industrial Expositions of the Meiji period, held in the years that avoided any international exposition, and which were, like the latter, competitive (a new idea, like many others, in Japan), it was the commissioning companies that won the major prizes; the actual makers won lesser prizes. This points directly to the agenda of the government; to get these things made for exhibition for the good name of Japan. This top-of-the-range craftsmanship must be distinguished from the mass of inferior goods that the Japanese, rightly assessing the lower ends of the market, poured into Europe and America. Usually there is no problem; one can instantly detect the difference between the bad and the good. Herbert Ponting (published in 1910) recounts how he visited the celebrated metalworker Kuroda Kiichi in Kyōto: shown some of his work, Ponting praised it, whereupon Kuroda deprecated it and showed him what he and his discerning Japanese clients (for there was a good internal market for the best modern work, too) would regard as good enough; there was a distinct difference which Ponting could only then see. During the Edo period most craftsmen had either worked for a ‘feudal’ lord, or a daimyō, or had worked for the newly rich townsmen or merchants, the chōnin. In the former case, the best example would be the makers of sword-fittings, the tsuba and other accoutrements of the all-important pair of swords worn by every samurai. For such a craftsman, and there was a group in every regional centre of Japan, working for their local daimyō, the lord would have provided the workshop and the material, had a strong influence on the output and acquired the final result; after the law banning the wearing of swords in 1876 (surprisingly late), such craftsmen had perforce to become independent, to purchase their own raw materials and to make something saleable in a new and radically different market. The ceramics of the Meiji period were as innovative as and much more varied than those of any previous time in Japan. One has only to think of the ‘brocaded’ Satsuma decorated wares, which arose at the beginning of Meiji, to be aware that there was much new work. Admittedly the Satsume wares depend on Kyōto pottery for inspiration, but they rapidly developed their own various identities even though they were made in a number of different areas of Japan. There has been much argument about the origin of the Satsuma wares and when they first began, but it seems clear now that they came from the Kagoshima kilns of the Satsuma Daimyō in Kyushu, in the middle of the nineteenth century. The innumerable so-called Satsuma factories varied widely in both methods and results; for our purposes here we can point to three factories. The Kyōto factory of Kinkōzan Sōbei, set up in the middle Edo period, begun to specialise in high quality Satsuma type wares early in the Meiji period, employing good potters and fine individual painters, usually decorating in the fine scale more or less characteristic of any so-called Satsuma. See the dish [EA1992.71] for this fine style; see also the art nouveau vase of only a few years later, showing how Kinkōzan responded to the developing taste of the west. Yabu Meizan, on the other hand, was a decorator; blanks were imported, probably from Kagoshima and decorated in one of his two characteristic styles. The earlier style employed the use of stencils simply to outline the placing of the innumerable small figures that were his speciality (though he often used flowers, too); these would then be painted extremely finely in great detail. Frequently the figures formed a procession; the collection lacks such a piece. In 1910, at the time of the Japan-British Exposition at Shepherd’s Bush, he introduced a new, open style on a larger scale, where the design complemented the shape of the vessel, and the painting was an up-to-date version of the Shijō style, not unlike the style of Watanabe Seitei, a painter who provided designs for the cloisonné of Namikawa Sōsuke [EA2000.05 and EA1994.35]. For this style [see EA1993.12]. Another artist whose work included the Satsuma style was Makuzu Kōzan. His work is well represented in the collection, but without a piece in Satsuma style, such as he has only made early in his career. The porcelain of the Meiji period was more adventurous. We do not discuss here the large-scale porcelain manufacturers that grew up from the Imari tradition in Arita, and in more westernizing styles in or near Seto. The most famous of the former were the Fukugawa Seiji and the Koransha, while the most celebrated of the latter was to become the Noritake factory. A few individual potters, with private workshops varying from a few employees to those with some dozens, held closely to old traditions, making fine imitations of earlier wares. Suwa Sozan [EA1995.68] excelled in the imitation of classic Chinese porcelains, his modern work was less successful. Two potters stand out; Seifu Yohei and Makuzu Kōzan, the latter with a large and forward-looking factory, and with rapidly changing styles. Seifu was the more conservative of the two, less showy and colourful, but with elegance that greatly appealed to Japanese taste of the time. It is interesting that Seifu won more prizes in the competitive Domestic Expositions, while Kōzan won more International prizes. Miyagawa (Makuzu) Kōzan set up his factory in Yokohama shortly after 1870, when the port, as one of the few treaty ports, was full of foreigners. His first wares made there were exaggerated versions of a vaguely Satsuma-like style with high-relief animals and birds attached to vases and so-on. The contemporary critic Frank Brinkley described them as; ‘specimens that disgrace the period of their manufacture’: this was soon to change under two influences. Firstly, Kōzan sought the advice of Gottfried Wagener, an oyatoi gaijin, scientific polymath, who developed with Kōzan some new underglaze colours for porcelain, and secondly, it seems to have been the innovative approach of his adopted son Hanzan to whom he turned over the running of the factory in the 1880s, that ensured their success. The collection contains a good enough selection of the factory’s work for the visitor or reader to see the wide range of its products and to note its high standards of quality (See nos. 4-13). When Kōzan died in 1916, Hanzan took the name Kōzan II, and began to work with stoneware as well as porcelain [see EA1990.1]. The factory was destroyed in World War II. During the Meiji Period metal-work developed in several ways; the carvers now made jars and flower-vases [EAX.5148 and EAX.5149], the casters also made relief-decorated vases [EA1994.65], and the incisers developed new skills in the imitation of brush-work fluency of line (see the remarkable fan by Unnō Shōmin) [see EA1998.220] but perhaps the most extraordinary new skill was the tinting of metals, the fusion of alloys, to produce a polychrome effect in metal (see the small metal plaque by Kajima Ikkoku II set in a lacquer box) [EA1956.1787]. The fastest developing of the crafts was probably the cloisonné enamel. This was not an old craft in Japan, and probably no three-dimensional objects were made in cloisonné in Japan until the 1830s. It was then imitated from the Chinese by an amateur, Kaji Tsunekichi, from whom the industry, at first settled in Nagoya, was to spring. The development was one of better colours and skilful use of cloisons, the wire that was used to separate the colours. By the 1870s, larger areas could be made without the wire to prevent the colours running off during the innumerable firings necessary [see EA1993.39]. This in turn allowed a change in style and pieces could be made that were not mostly pattern-making, but pictorial. From here the industry divided into two; the cheap mass-produced stuff for the lower end of the market, and the artist-craftsmen-made pieces for the upper end of the market, for connoisseurs and expositions. It is with this latter that we concern ourselves here. Again there was a division into two tendencies, that of the makers who attempted to imitate brush-paintings, exemplified by the work of Namikawa Sōsuke [EA1990.4] of Nagoya and then of Tōkyō, and those who unashamedly exploited the possibilities offered by the wire, exemplified by Namikawa Yasuyuki (no relation to Sōsuke) of Kyōto. 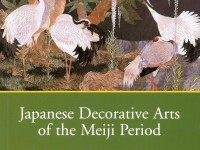 The six pieces by Yasuyuki illustrated in this volume demonstrate the increasing skill of the artist and the way he developed his techniques, allowing changes in style and image [EA1995.151, EA1993.39, EA1988.1, EA2000.48, EA2000.180, and EA2002.177]. Further developments of the craft included raised cloisonné, moriage, which sounds like a contradiction in terms [see EA1998.214] by Andō Jūbei, and for the apogee, no. 41 by Kumeno Teitarō [EA1999.104]) and so-called bodiless cloisonné, plique-à-jour [see EA1990.5], the latter imitated from French craftsmen, notably Fernand Thesmar, whose work had been seen by Japanese cloisonné artists in Paris in 1900. By 1918 the market for expensive cloisonné had collapsed; thus the industry was only producing the best work for about forty years. In contrast, lacquer work seems at first look to have been conservative, for there was no western industry with which to compete, but in fact, small innovations made a considerable difference to the finished product. Research was officially instigated, and copies of famous antique lacquers commissioned. Leading among the innovative lacquerers was Shibata Zeshin but there were others, too. A Lacquerers Society was set up in 1891 (was it a coincidence that this was the year that the Kiriu Kōshō Kaisha went bankrupt?) to draw together craftsmen from all over Japan. Tōkyō became the centre of the industry, to the detriment of Kyōto, but Kaga also remained a provincial centre. Again, there is a sharp division between the cheap and the expensive; the Ashmolean (at the time of going to press) owns no spectacular piece of Meiji lacquer, but has one or two fine pieces. An offshoot was the style called Shibayama after the family of craftsmen of that name who may or may not have invented it. This demands minutely carved miniature bas-relief carvings of coral, ivory, pearl-shell or semi-precious stone to be set into a lacquer (or ivory) base, often in combination with other crafts such as cloisonné or silver filigree [see EA2000.5.a and EA2000.5.b]. The carvers of Buddhistic statues were forced, by the abolition of Buddhism as the official State Religion, to adapt to other genres; many turned to wood or ivory carving of realistic western-style figures; this was encouraged by the government when they employed Vincenzo Ragusa, an Italian High Victorian-style sculptor as an oyatoi gaijin, an official teacher of western sculpture. Some of these carvers made wood sculptures of considerable size, others ivory figurines (okimono) and yet others, netsuke. Meiji period Japan must have been an exciting place for the craftsman; cut-throat and competitive, no doubt, but always at the cutting-edge of innovation. We can see the results today in some of the finest and most skilled works of art-craft ever made. The collection continues to grow; as we go to press the museum is attempting to purchase a superb shibuichi figure of a hawk by Jōmi Eisuke (1839-1899), a sculpture of purely Japanese inspiration, to form a comparison with the westernizing work of the mother and child bronze by Udagawa Kazuo [EA1989.14].